The ship's cargo of soybeans was worth $20 million. Alas, the ship arrived 30 minutes too late to the port of Dalian, and has been sailing in circles ever since. The 299-metre bulk carrier is carrying 70,000 tons of soybeans, worth about $20 million. Michael Magdovitz, an analyst at Rabobank, told The Guardian that Pegasus’ soybeans aren’t the only ones adrift; another carrier named Star Jennifer has also been waiting for a fortnight. The Amsterdam-based trading company Louis Dreyfus is reportedly paying about $12,500 per day, to keep Pegasus afloat in an attempt to wait out the trade war. But commodities experts actually think this is a smart move, and keeping the carrier at sea for months might even make financial sense. Offloading the cargo in China would incur a 25% tariff, adding another $6 million in costs, and diverting the vessel to another port might be even more expensive. China is the world’s biggest soybean importer and America’s largest customer, with trade totaling $14 billion last year. But the soybean saga might end soon. Due to strong demand for the commodity, which is used in biodiesel, oil, and feed for livestock—hog feed in China is 20% soybean meal—Pegasus might soon get a break. China has been relying on Brazil’s produce, but its soybeans supply will soon start falling just as US harvests pick up. 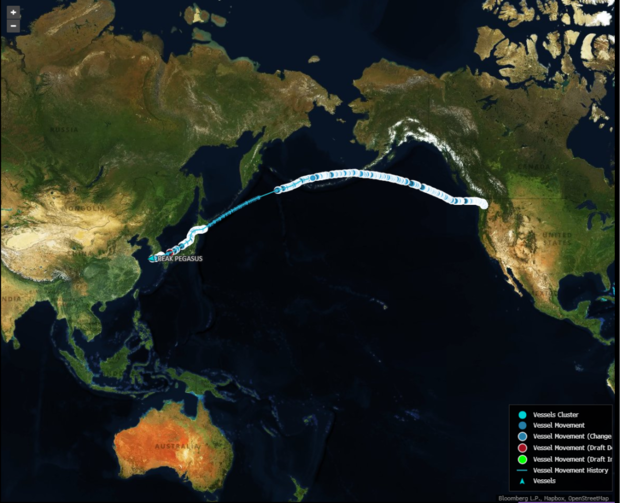 Just last week, the first US shipment of soybeans in three weeks set sail for Shanghai, though whether it reaches its destination remains to be seen.